While the global climate has been remarkably stable for the past 10000 years, providing a backdrop for the development of human civilisation, there are now clear signs that the climate is changing ( 1 ). This is widely recognised as one of the most prominent challenges facing humankind. Measurements of the global atmospheric concentrations of greenhouse gases (GHG) ( A ) show marked increases since pre-industrial times, with levels of carbon dioxide (CO2) far exceeding the natural range of the past 650000 years. The concentration of atmospheric CO2 has increased from a pre-industrial level of about 280 ppm to more than 387 ppm in 2008( 2 ). 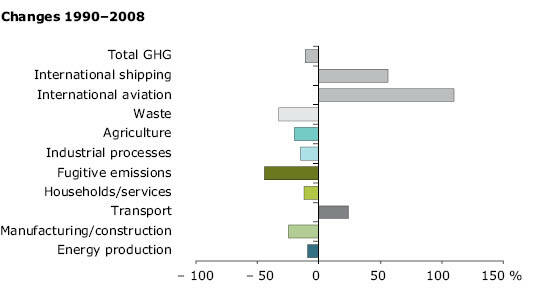 Increases in GHG emissions are largely due to the use of fossil fuels, although deforestation, land-use change and agriculture also provide significant but smaller contributions. As a consequence, the average global air temperature in 2009 had risen by 0.7 to 0.8°C since pre-industrial times( 3 ). Indeed, the Intergovernmental Panel on Climate Change (IPCC) concluded that global warming since the middle of the 20th century is very likely to have been due to human influences( B )( 4 ). In addition, best estimates of current projections suggest global mean temperatures could rise by as much as 1.8 to 4.0°C — or 1.1to 6.4°C taking into account the full uncertainty range — over the course of this century if global action to limit GHG emissions proves unsuccessful( 4 ). Recent observations give reason to believe that the rate of growth of GHG emissions and many climate impacts are approaching the upper boundary of the IPCC range of projections rather than the lower ones( C )( 1 )( 5 ). Changes in climate and temperature increases of such magnitude are associated with a wide range of potential impacts. Already over the last three decades, warming has had a discernible influence at the global scale on observed changes in many human and natural systems — including shifts in precipitation patterns, rising global mean sea level, the retreat of glaciers and decline in the extent of Arctic sea ice coverage. Furthermore, in many instances river run-off has changed, especially in snow- or glacier-fed rivers( 6 ). Other consequences of changing climatic conditions include increases in global mean ocean temperatures, widespread melting of snow and ice sheets, increased flood risk for urban areas and ecosystems, ocean acidification, and extreme climatic events including heat waves. The impacts of climate change are expected to be felt in all regions of the planet, and Europe is no exception. Unless action is taken, climatic changes are expected to lead to considerable adverse impacts. Note: The bars on the right of the figure indicate the best estimate (solid line within each bar) and the likely range assessed for all six IPCC marker scenarios at 2090–2099 (relative to 1980–1999). The horizontal black line has been added by EEA to indicate the EU Council conclusion and UNFCCC Copenhagen Accord objective of 2°C maximum temperature increase above pre-industrial (1.4°C above 1990 because of about 0.6°C temperature increase from the pre-industrial period to 1990). Source: Intergovernmental Panel on Climate Change (IPCC)( a ). In addition, with increasing global temperatures, there is an increasing risk of passing tipping points that may trigger large-scale, non-linear changes (Chapter7). Guiding the political discussions on how to limit dangerous interference with the climate system is the internationally recognised goal to limit the global mean temperature increase since pre-industrial times to below 2°C( 7 ). Meeting this target will require substantial reductions in global GHG emissions. Considering only the atmospheric CO2 concentration, and applying estimates of global climate sensitivity, this overarching target can be translated into limiting atmospheric CO2 concentrations to around 350–400ppm. If all GHG emissions are included, a limit of 445–490 ppm CO2-equivalent is often cited( 4 )( 8 ). As indicated above, atmospheric CO2 concentrations are already close to this level and are currently increasing by about 20 ppm per decade( 2 ). Thus, to achieve the below 2°C target, global CO2 emissions would need to level off in the present decade and be reduced significantly thereafter( 5 ). In the long run, reaching this target is likely to require emission cuts of around 50% compared to 1990 levels by 2050 globally( 4 ). For the EU-27 and other industrialised countries this translates to emission cuts of 25–40% by 2020 and 80–95% by 2050 — if developing countries also reduce their emissions substantially compared to their respective business-as-usual emission projections. However, even a 2°C guardrail provides no guarantee for avoiding all adverse climate change impacts and is subject to uncertainties. The United Nations Framework Convention on Climate Change (UNFCCC) Conference of the Parties held in Copenhagen in 2009 took note of the Copenhagen Accord, which calls for an assessment of its implementation by 2015: This would include consideration of strengthening the long-term goal(by) referencing various matters presented by the science, including in relation to temperature rises of 1.5°C( 7 ). Meeting the target of limiting global temperatures increases to less than 2°C will require a concerted global effort — including further substantial GHG emission reductions in Europe. In 2008, the EU was responsible for between 11 and 12% of global GHG emissions( 9 ) — while being home to 8% of the world’s population. According to current projections taking into account population growth and economic development worldwide, Europe’s percentage contribution will decrease, as emissions in emerging economies continue to increase( 10 ). 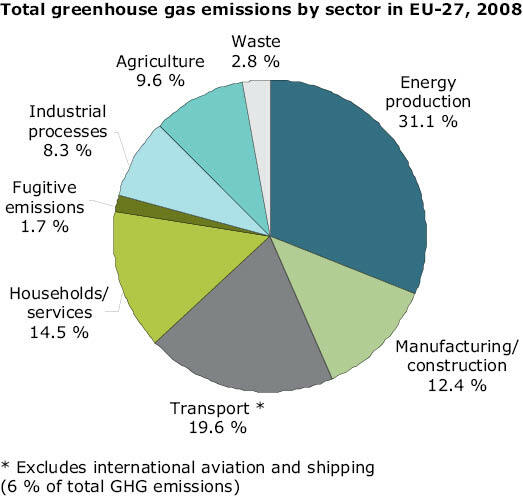 Annual emissions of GHG in the EU in 2008 corresponded to around 10 tonnes of CO2-equivalent per person( 11 ). 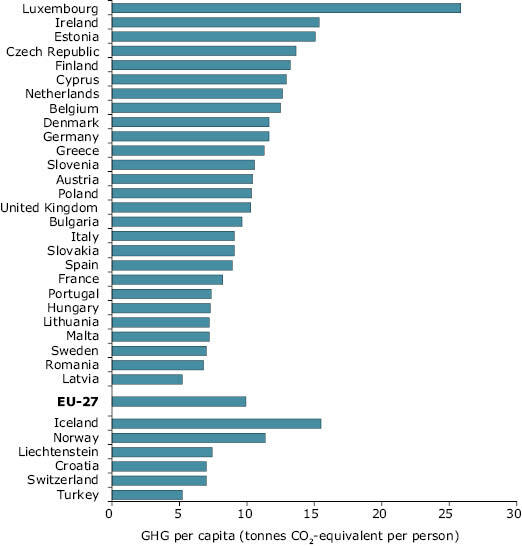 In terms of total emissions, the EU is in third place behind China and the USA( 12 ). Meanwhile, the trends in EU GHG emissions relative to economic development — measured as gross domestic product (GDP) — in the EU indicate an overall decoupling of emissions from economic development over time. Between 1990 and 2007, emissions per unit of GDP decreased in the EU-27 by more than a third( 12 ). However, it should be noted that these emission figures only represent what is emitted within the EU territory, calculated according to agreed international guidelines under UNFCCC. Europe’s contribution to global emissions could be greater if European imports of goods and services, with their ‘embedded carbon’, are taken into account. Current emission data confirm that the EU-15 Member States are on track to meet their joint target of cutting emissions by 8% compared to base-year levels — 1990 for most countries — during the first commitment period under the Kyoto Protocol: the years 2008 to 2012. 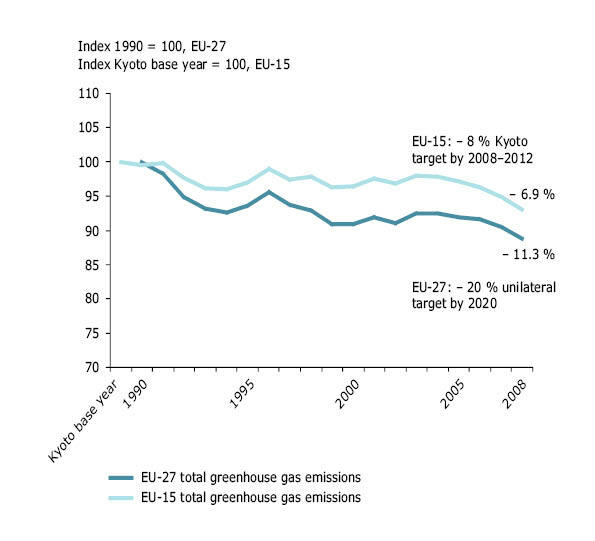 Reductions in the EU-27 have been even greater than in the EU-15; domestic GHG emissions fell by approximately 11% between 1990 and 2008( D )( 11 ). It is worth noting that the UNFCCC and its Kyoto Protocol do not cover all GHGs. Many of the substances controlled under the Montreal Protocol, such as chlorofluorocarbons (CFCs), are also potent GHGs. The phasing out of climate-changing ozone-depleting substances (ODS) under the Montreal Protocol has contributed indirectly to a very significant decrease in GHG emissions: this has reduced GHG emissions globally by more than the reductions expected through compliance with the provisions of the Kyoto Protocol by the end of 2012( 13 ). The main sources of man-made GHG emissions globally are the burning of fossil fuels for electricity generation, transport, industry and households — which together account for about two-thirds of total global emissions. Other sources include deforestation — which contributes about a fifth — agriculture, land-filling of waste, and the use of industrial fluorinated gases. Overall, in the EU, energy consumption — power and heat generation and consumption in industry, transport and households — accounts for nearly 80% of GHG emissions( 9 ). Historic trends of GHG emissions in the EU over the past 20 years are the result of two sets of opposing factors( 11 ). • and demographic changes over the past decades. • and partly due to the economic restructuring in eastern Member States in the early 1990s. 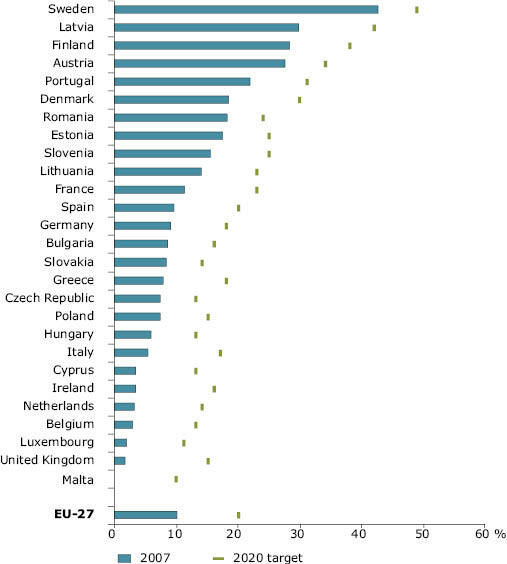 EU GHG emissions trends between 1990 and 2008 were dominated by the two largest emitters, Germany and the United Kingdom, which together were responsible for more than half of the total reduction in the EU. Significant reductions were also achieved by some EU-12Member States, such as Bulgaria, Czech Republic, Poland and Romania. This overall decrease was partly offset by emission increases in Spain and, to a lesser extent, Italy, Greece and Portugal( 9 ). The overall trends are influenced by the fact that, in many cases, emissions from large point sources have been reduced, while at the same time emissions from some mobile and/or diffuse sources, especially those transport-related, have increased substantially. In particular, transport still remains a problematic emitting sector. Transport emissions of GHGs increased by 24% between 1990 and 2008 in the EU-27, excluding emissions from international aviation and marine transport( 9 ). While rail freight and inland waterways saw a decline in market share, the number of cars in the EU-27 increased by 22%, or 52 million cars, between 1995 and 2006( 14 ). Note: Emissions from international aviation and international maritime navigation, which are not covered by the Kyoto Protocol, are not included in the top figure. If included in the total, the share of transport would reach around 24% of total EU-27 GHG emissions in 2008. The increases in greenhouse gas emissions in the transport sector — as well as several other environmental impacts of transport — continue to be closely linked to economic growth. Freight transport tends to grow slightly faster than the economy, with road and air freight recording the largest increases in the EU-27 (43% and 35%, respectively, between 1997 and 2007). The share of rail and inland waterways in the total freight volumes declined during that period. Passenger transport continued to grow but at a slower rate than the economy. Air travel within the EU remained the fastest growth area, increasing 48% between 1997 and 2007. Car journeys remained the dominant mode of transport, accounting for 72% of all passenger kilometres in the EU-27. Greenhouse gas emissions from transport (excluding international aviation and maritime transport) grew by 28% between 1990 and 2007 in EEAcountries (by 24% in EU-27), and now account for around 19% of total emissions. In the European Union, only Germany and Sweden are on track to meet their 2010 indicative targets for biofuels use (however, see also discussion related to bioenergy production in Chapter 6). Despite recent reductions in air pollutant emissions, road transport was the largest emitter of nitrogen oxides and the second largest contributor of pollutants forming particulate matter in 2007 (see also Chapter 5). Road traffic remains by far the largest source of exposure to transport noise. The number of people exposed to damaging noise levels, especially at night, is expected to increase unless effective noise policies are developed and implemented in full (see also Chapter 5). The report concludes that addressing the environmental aspects of transport policy effectively requires a vision for what the transport system should be like by the mid 21st century. The process of establishing a new Common Transport Policy is essentially about creating this vision and then designing policies to achieve it. In its Climate and Energy Package( 15 ), the EU has committed to further reduce emissions by (at least) 20% from 1990 levels by 2020. Furthermore, the EU will commit to reducing emissions by 30% by 2020, provided that other developed countries commit themselves to comparable emission reductions and developing countries contribute adequately according to their responsibilities and respective capabilities. Switzerland and Liechtenstein (both 20 to 30% reductions) as well as Norway (30 to 40%) have made similar commitments. Current trends show that the EU-27 is making progress towards its 2020 emission reduction target. Projections by the European Commission indicate that EU emissions would be 14% below 1990 levels by 2020, taking into account implementation of national legislation in place by early 2009. Assuming that the climate and energy package is fully implemented, the EU is expected to reach its 20% GHG reduction target( 16 ). It is worth noting that part of the additional reduction could be achieved through the use of flexible mechanisms both in the trading and non-trading sectors( E ). Key related efforts include the expansion and strengthening of the EUEmission Trading System( 17 ), as well as setting legally binding targets for increasing the share of renewable energy to 20% of overall energy consumption, including a 10% share in the transport sector, compared to a total share of less than 9% in 2005( 18 ). Promisingly, the share of renewable sources in energy production has been increasing, and energy generation using biomass, wind turbines and photovoltaics in particular has grown substantially. Limiting global mean temperature increases to below 2°C in the longer term and reducing global GHG emissions 50% or more compared with 1990 by 2050, is generally considered to be beyond what can be achieved with incremental emission reductions. In addition, systemic changes in the way we generate and use energy, and how we produce and consume energy-intensive goods are likely to be required. Thus, further improvements in both energy efficiency and resource-use efficiency need to continue as a key component of GHG emission strategies. In the EU, significant improvements in energy efficiency occurred in all sectors due to technological development in, for example, industrial processes, car engines, space heating and electrical appliances. Also, energy efficiencies of buildings in Europe have significant potential for long-term improvements( 19 ). On a larger scale, smart appliances and smart grids can also help improve the overall efficiency of electricity systems, enabling inefficient generation to be used less frequently through reducing peak loads. To enable the incorporation of large amounts of intermittent generation from renewable energy, we will have to rethink the way we move energy from generator to user. Part of the change is expected to come from enabling large generation at distances far away from the users, and transmitting it efficiently between countries and across seas. Programmes such as the DESERTEC initiative( c ), the North Seas Countries’ Offshore Grid Initiative( d ) and the Mediterranean Solar Plan( e ) are aimed at tackling this issue, and provide a partnership between governments and the private sector. Such super-grids should complement the benefits of a smart grid. Smart-grids can enable consumers of electricity to become more informed about their consumption behaviour and empower them to engage actively in changing it. This kind of system can also assist the deployment of electric vehicles, and in turn to contribute to the stability and viability of such grids( f ). Over the long term, deploying such grids can reduce future investments required to upgrade Europe’s transmission systems. Many key climate indicators are already moving beyond the patterns of natural variability within which contemporary societies and economies have developed and thrived. The main consequences of climate change expected in Europe include an increased risk of coastal and river floods, droughts, loss of biodiversity, threats to human health, and damage to economic sectors such as energy, forestry, agriculture, and tourism( 6 ). In some sectors, new opportunities may occur regionally, at least for some time, such as improved agricultural production and forestry activities in northern Europe. Projections for climate change suggest that the suitability of some regions for tourism — especially in the Mediterranean — may decline during the summer months, although there may be an increase during other seasons. Similarly, opportunities for expanding tourism in northern Europe may come about. However, over a longer period and with increasing extreme events, adverse effects are likely to dominate in many parts of Europe( 6 ). The consequences of climate change are expected to vary considerably across Europe, with pronounced impacts expected in the Mediterranean basin, north-western Europe, the Arctic and mountainous regions. For the Mediterranean basin, in particular, increasing mean temperatures and decreases in water availability are expected to exacerbate current vulnerability to droughts, forest fires and heat waves. Meanwhile, in north-western Europe, low-lying coastal areas face the challenge of sea-level rise and an increased risk of associated storm surges. Temperature increases are projected to be greater than average in the Arctic, placing particular pressure on its very fragile ecosystems. Additional environmental pressures may result from easier access to oil and gas reserves, as well as new shipping routes as ice cover decreases( 20 ). Mountain areas face substantial challenges including reduced snow cover, potential negative impacts on winter tourism and extensive species loss. In addition, permafrost degradation in mountain regions may create infrastructural problems as roads and bridges may not be able to cope. Already today, the vast majority of glaciers in European mountains are in retreat — which also affects water resource management in downstream areas( 21 ). In the Alps, for example, glaciers have lost approximately two-thirds of their volume since the 1850s, and acceleration of glacial retreat has been observed since the 1980s( 6 ). Similarly, coastal and river-flood-prone areas across Europe are particularly vulnerable to climatic changes, as are cities and urban areas. Source: EEA; JRC; WHO( g ). Climate change is projected to play a substantial role in biodiversity loss and puts ecosystem functions at risk. Changing climatic conditions are responsible, for example, for the observed northward and uphill distribution shifts of many European plant species. These are projected to need, for survival, to move several hundred kilometres to the north during the 21st century — which will not always be possible. A combination of the rate of climate change and habitat fragmentation, which results from obstacles such as roads and other infrastructure, is likely to impede the migration of many plant and animal species, and may lead to species composition changes and a continuing decline in European biodiversity. The timing of seasonal events, phenology, for plants and the life cycles of animal groups — both terrestrial and marine — alters with climatic change( 6 ). Changes in seasonal events, flowering dates and agricultural growing seasons are observed and projected. Phenology shifts have also increased the length of the growing season of several agricultural crops in northern latitudes over recent decades, favouring the introduction of new species that were not previously suitable. Atthe same time, there has been a shortening of the growing season at southern latitudes. Such changes in the cycles of agricultural crops are projected to continue — potentially severely impacting agricultural practices( G )( 6 ). Similarly, climatic changes are expected to affect aquatic ecosystems. Warming of surface water can have several effects on water quality, and hence on human use. These include a greater likelihood for algal blooms to occur and the movement of freshwater species northwards, as well as changes in phenology. Also within marine ecosystems, climatic changes are likely to affect the geographic distribution of plankton and fish, for example a changed timing of the spring phytoplankton bloom, putting additional pressures on fish stocks and related economic activities. A further major potential impact of climate change, in combination with land-use changes and water management practices, is the intensification of the hydrological cycle — due to changes in temperature, precipitation, glaciers and snow cover. In general, annual river flows are increasing in the north and decreasing in the south, a trend that is projected to increase with future global warming. Large changes in seasonality are also projected, with lower flows in summer and higher flows in winter. As a consequence, droughts and water stress are expected to increase, especially in southern Europe and particularly in summer. Flood events are projected to occur more frequently in many river basins, particularly in winter and spring, although estimates of changes in flood frequency and magnitude remain uncertain. While information on the impacts of climate change on soil and the various related feedbacks is very limited, changes in the bio-physical nature of soil are likely due to projected rising temperatures, changing precipitation intensity and frequency, and more severe droughts. Such changes can lead to a decline in soil organic carbon stocks — and a substantial increase in CO2 emissions. Projected increased variations in rainfall patterns and intensity are likely and make soils more susceptible to erosion. Projections show significant reductions in summer soil moisture in the Mediterranean region, and increases in north-eastern Europe( 6 ). Furthermore, prolonged drought periods due to climatic changes may contribute to soil degradation and increase the risk of desertification in parts of the Mediterranean and eastern Europe. Climate c hange is also projected to increase health risks due to, for example, heat waves and weather-related ailments (see Chapter5 for further details). This highlights the need for preparedness, awareness-raising and adaptation( 22 ). The related risks are very dependent on human behaviour and the quality of health-care services. Furthermore, a number of vector-borne diseases as well as some water- and food-borne disease outbreaks may become more frequent with rising temperatures and more frequent extreme events( 6 ). In parts of Europe, there may be some benefits to health, including fewer deaths from cold. It is, however, expected that the benefits will be outweighed by the negative effects of rising temperatures( 6 ). Even if European and global emission reductions and mitigation efforts over the coming decades prove successful, adaptation measures will still be necessary to deal with the unavoidable impacts of climate change. ‘Adaptation’ is defined as the adjustment of natural or human systems to actual or expected climate change or its effects in order to moderate harm or exploit beneficial opportunities( 23 ). Adaptation measures include technological solutions (‘grey’ measures); ecosystem-based adaptation options (‘green’ measures); and behavioural, managerial and policy approaches (‘soft’ measures). Practical examples of adaptation measures include early warning systems related to heat waves, drought and water scarcity risk management, water demand management, crop diversification, coastal and river flood defences, disaster risk management, economic diversification, insurance, land use management, and enhancing green infrastructure. These need to reflect the degree to which vulnerability to climatic change differs across regions and economic sectors, as well as across societal groups — especially the elderly and low-income households, both of which are more vulnerable than others. Furthermore, many adaptation initiatives should not be undertaken as stand-alone actions, but embedded within broader sectoral risk reduction measures, including water-resource management and coastal defence strategies. The costs of adaption in Europe can potentially be large — and may amount to billions of Euro per year in the medium and long term. However, economic assessments of the cost and benefits are subject to considerable uncertainties. Nevertheless, assessments of adaptation options have suggested that timely adaptation measures make economic, social and environmental sense, as they may reduce potential damages very significantly and pay off many times compared to inaction. 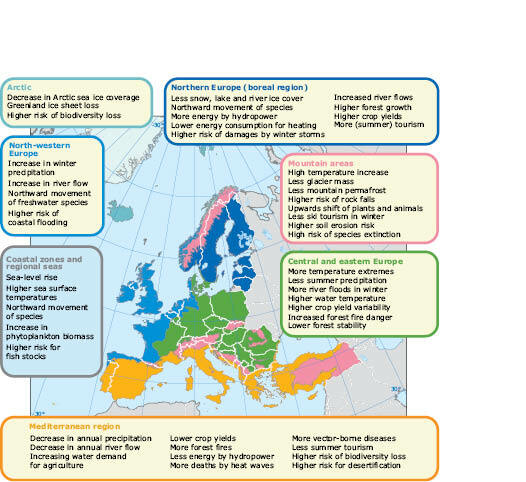 In general, countries are aware of the need to adapt to climate change and 11 EU Member States had adopted a national adaptation strategy by spring 2010( H ). 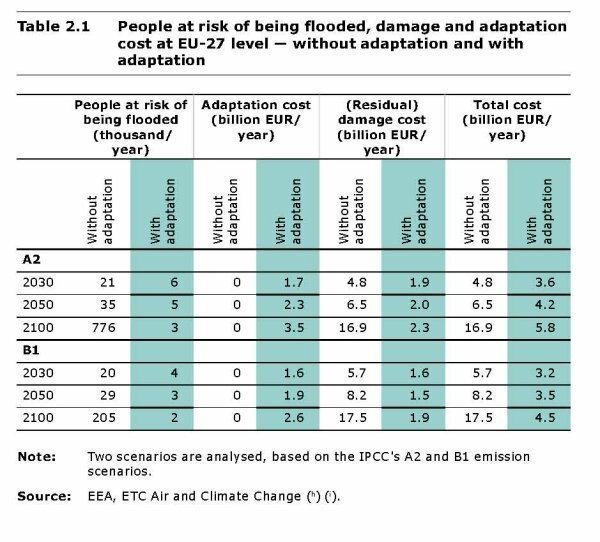 At a European scale, the EU White Paper on Adaptation( 24 ) is a first step towards an adaptation strategy to reduce vulnerability to the impacts of climate change, and complements actions at national, regional and even local levels. Integration of adaptation into environmental and sectoral policy domains — such as those related to water, nature and biodiversity, and resource efficiency — is an important aim. 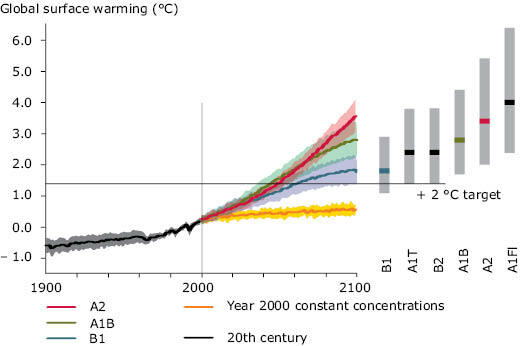 Note: Two scenarios are analysed, based on the IPCC’s A2 and B1 emission scenarios. Source: EEA, ETC Air and Climate Change( h )( i ). However, the EU White Paper on Adaptation recognises that limited knowledge is a key barrier and calls for a stronger knowledge base. To address related gaps, the creation of a European clearinghouse on climate change impacts, vulnerability and adaptation is foreseen. This aims to enable and encourage the sharing of information and good adaptation practices between all stakeholders. Climate change is a result of one of the greatest market failures the world has seen( 25 ). The issue is closely intertwined with other environmental issues as well as broader societal and economic developments. Responding to climate change, by mitigating or adapting, can and should therefore not be done in isolation — as responses will undoubtedly affect other environmental issues both directly and indirectly (Chapter6). Synergies between adaptation and mitigation measures are possible (for example in the context of land and ocean management) and adaptation can help increase resilience against other environmental challenges. Meanwhile, ‘mal-adaptation’ is to be avoided; this refers to measures that are either disproportionate, cost-ineffective or conflict with other policy objectives in the long term (such as artificial snow making or air conditioning vis-à-vis mitigation targets)( 21 ). Many climate change mitigation measures will deliver ancillary environmental benefits including reductions in emissions of air pollutants from fossil fuel combustion. Conversely, reduced air pollutant emissions related to climate change policies are also expected to lead to a fall in pressures on public health systems and ecosystems, for example, through lower urban air pollution or decreased levels of acidification( 6 ). Climate change policies are already reducing the overall cost of pollution abatement needed to meet the objectives of the EU’s Thematic Strategy on Air Pollution ( 26 ). It has been suggested that the inclusion of the effects of air pollution on climate change in air quality strategies delivers substantial efficiency gains by reducing particulate matter and ozone precursors in addition to targeting CO2 and other long-lived GHGs( 27 ). The implementation of measures to combat climate change is likely to deliver considerable ancillary benefits in air pollution abatement by 2030. This includes lower overall costs of controlling air pollutant emissions of the order of EUR10billion per year and a reduction in damage to public health and ecosystems( I )( 28 ). Such reductions are particularly notable for oxides of nitrogen (NOX), sulphur dioxide (SO2), and air-borne particles. Furthermore, the reduction of emissions of black soot and other aerosols — such as ‘black carbon’, carbon aerosols from fossil fuel combustion and burning of biomass — may have substantial benefits both in improving air quality and limiting the related warming effect. Black carbon emitted in Europe contributes to carbon deposition on ice and snow in the Arctic region, which may accelerate the melting of the ice caps and exacerbate climate change impacts. However, in other areas ensuring co-benefits between tackling climate change and responding to other environmental challenges may be less straightforward. There may be, for example, trade-offs between the large-scale deployment of different renewable energy types and the improvement of Europe’s environment. Examples of this include the interplay between hydropower generation and goals of the Water Framework Directive( 29 ), the indirect land-use effects of bioenergy production which can greatly reduce or eliminate carbon benefits( 30 ), and the sensitive placement of wind turbines and barrages in order to reduce impacts on marine and bird life. Conversely, adaptation and mitigation measures that build on an ecosystem perspective have the potential to lead to win-win situations as they both provide adequate responses to climate change challenges and aim to sustain natural capital and ecosystem services in the long term (Chapters6 and 8). For references, please go to https://www.eea.europa.eu/soer/synthesis/synthesis/chapter2.xhtml or scan the QR code.